In the eighth pAsuram, when asked “Has there not been anyone who surrendered to other dhEvathAs to have their desires fulfilled?”, AzhwAr says “It is emperumAn who made them fulfil the desires of their devotees; so you surrender unto emperumAn himself and be uplifted”. Subsequently, AzhwAr says “Servitors of such krishNa who is the lord of all dhEvathAs and the one who has SrIvathsa [mole on his chest], have become well established in this world. You surrender unto them and become uplifted”. Eighth pAsuram. AzhwAr says “emperumAn established other dhEvathAs all over the world to facilitate surrendering of chEthanas (sentient beings) who are filled with rajas (passion) and thamas (ignorance) qualities; SrIvaishNavas who are captivated by the distinguished form of such emperumAn have spread everywhere. You too, like them, try to surrender unto him”. krishNa, who is the lord of all lords, established his different types of forms/bodies as the dhEvathAs who are worshippable in nithya and naimiththika karmas which are duties to be performed certainly by all words which have variegated interests, as an offering to be uplifted. The bhAgavathas, who are servitors of such emperumAn who is having the SrIvathsa mole which highlights his supremacy, on his divine chest, singing many songs, without hatred of the worldly defects, lived as great personalities; you be uplifted by approaching and worshipping them. iRukkum … – As the crop which is sowed, must be dutifully taken care of, to facilitate all of you to provide offerings to the respective dhEvathAs as per your puNya/pApa, he established these dhEvathAs who are forms/bodies of him, in all the worlds; this is done by emperumAn himself who is the controller of those dhEvathAs and others [who worship them]. Just as a king would establish administrators in each towns. 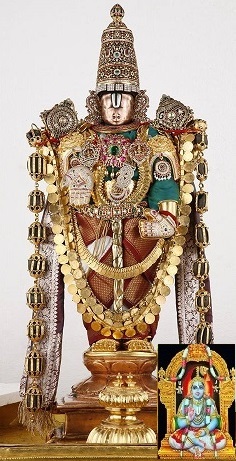 maRuth thiru mArvan – One who is having the SrIvathsa mole and SrI mahAlakshmi on his chest; also explained as – the one who is having SrIvathsa mole on his divine chest. avan … – Those SrIvaishNavas who are captivated in his distinguished form, singing songs out of overwhelming love, spread everywhere in the world without the hatred “we have to reside in this [cruel] samsAram (material realm)”. mEvith thozhudhu uymminIrE – This being the case, you approach them, surrender unto them and be uplifted; also explained as – being ananyaprayOjanar (exclusive devotees without any ulterior motives) like those sathva nishtars (those who are fixed in sathva (goodness) guNam), surrender unto sarvESvaran and be uplifted. This entry was posted in thiruvAimozhi, thiruvAimozhi 5th centum on May 31, 2017 by Sarathy Thothathri.